It is hot, humid and thick here in the New York region. Just to be clear, I am not talking sorta hot- I am talking Alabama in August hot- 90 plus degrees with humidity to match! And, the scary thing is that school isn’t finished yet! For me, given the hot Spring we have had, this school year feels like the monster that just won’t die. Somebody grab the silver stake already and drive it into this school year’s heart. We need Summer! Luckily, silver stake or not, the school year finally dies tomorrow. Phew! Anyway, when it is this hot, there are few things that feel right to cook, let alone eat. I want to keep my kitchen cool- and the idea of manning a hot grill fire just doesn’t work when I am already melting. My thoughts turn to things that are cool, crisp and icy- but have substance. The heat of the day has drained me and all I really want is a little something before I call it a night. 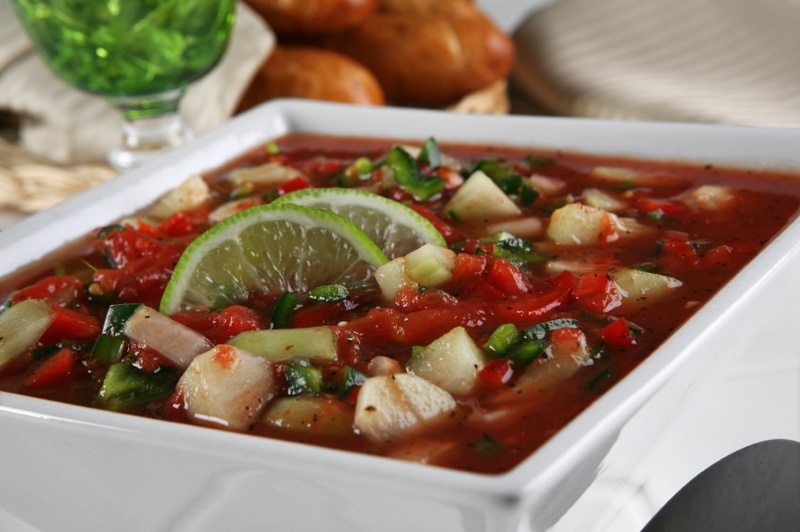 Enter Gazpacho to save the day! So yesterday, I made gazpacho in the coolness of my kitchen- with no lights on and in surreal quiet because my children were all off at the pool-like the sensible humans they are. I had no idea if the kids would even try it when they got home- I wasn’t silly enough to hope that they would like it. I am a realist at heart. But, what ever they did didn’t really matter, because I was making it for me. I had leftover grilled chicken in the fridge and the children could have that if they wouldn’t eat the cool delicious soup. They came through the door a tired and wet bunch of puppies. They were starving. The soup was set before them- with chicken on the side so they did not completely freak! Harrison took one bite and, as expected, shook his head and said “ugh, no.” and moved on to the chicken. Julia, however, drained her bowl. My foodie, veggie loving daughter stayed true. She loved every bite and asked for more. She called it “salad soup.” Quite smart if you ask me! 1. Place the bread, garlic and lemon juice in a food processor fitted with the steel blade and process to a smooth paste. Transfer to a large (and deep) bowl. 2. Add all the vegetables to the bread paste and toss to combine. Stir in the V-8, vinegar and olive oil. Season with salt and pepper. 3. Puree at least half of the soup- I usually puree 2/3-in the food processor and combine with the remaining soup. Refrigerate until very cold. This entry was written by Caroline, posted on June 24, 2010 at 6:26 pm, filed under appetizers, light, lunch, soup, vegetarian. Bookmark the permalink. Follow any comments here with the RSS feed for this post. Post a comment or leave a trackback: Trackback URL. Caroline, the gazpacho was a huge hit with Carol and her family here in Dallas!!! Nice and cool in hot and humid D.! And they made me leave my copy of the recipe….